We sometimes had these cheese slices when I was a kid. It must have been my early computer-geek (binary) mind at work, but I would eat them by folding them in half, so one half broke off, eating that, then repeating with the half that was left… until the bit left in my hand was so microscopic it couldn’t be folded in half any more. I think eventually everybody figured out that the processed cheese was really not that healthy compared to other snacks. Next → Next post: First! yes, I liked playing with cheese singles. I was brought up on Kraft processed cheese so liked the “fake” cheese product. My kids hate singles cheese and have never had processed cheese. No, it wasn’t just you. I’d completely forgotten about doing this. Perhaps it’s not coincidental that I grew up to work in the IT industry. I think you’re on to something. Cheese slices? How modern. My Kraft Cheddar came in a blue cardboard box. It had to be manually sliced by a knife after the foil was peeled off.The foil was not always peeled off very well. Foil in your teeth is not great. Is cheese like paper, in that you can get a max of seven folds-in-half? What was the maximum number of halvings that you achieved as a child without using a cutting device? I’m with Andrew first – I remember my mother buying the blue cardboard box of Kraft straight off the supermarket shelf in 1971 – so processed it wasn’t even refridgerated. But even though I have about as much mathematical and scientific leanings as a cowpat I too did the fold, eat half, fold again cheese slice method…. 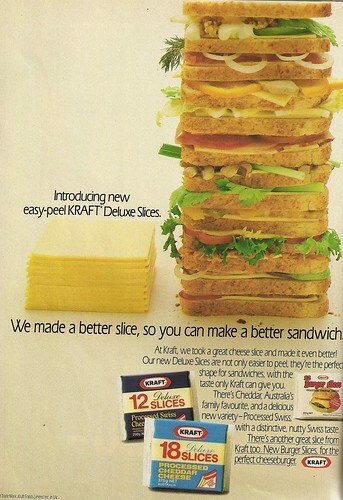 When I used to love eating cheese, I did the same way as Daniel, by folding them in half, and then fold it again. Except for pieces of celery or carrot, what kind of snack is more healthy than cheese ? And there is virtually no nutritional different between Kraft cheese and the more wanky “real” sort. Yes, I did the fold. But really, can you even call that stuff cheese? I was so envious of kids who ate processed food, being from migrant parents (Netherlands) I had to eat Edam cheese on Rye bread which for a kid at school was “eating wog crap” or so I was led to believe (early 70s) even things like cordial were a strange and wonderful treat when having lunch at a friends house. What is it about that photo, that seem instantly recognisable as 70’s to me ? Is it the incandescent lighting ? The Ektachrome tones in the photo ? Whenever I see a copy of an old ad in colour from that era, there is something distinctive about the coloring. Is it the magazine printing technology ? Is it just the way paper and ink fade ? I too did the fold and fold again thing. And for those who remember the cheese in the blue packet, they still sell it, still straight off the shelf! I buy it from time to time because it takes me back to my childhood! Better than the Kraft ‘parmesan’ cheese in that green tube shaker pack. Any cheese that doesn’t need to be refrigerated is suspect.